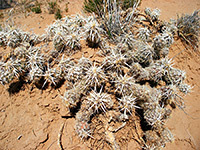 Beyond the Rio Grande, Albuquerque is bordered on the west side by a low, barren, volcanic plateau (West Mesa) - 200 feet high and extending for over 15 miles, the only feature rising above the flat grasslands are the cones of several long-extinct volcanoes, but even these are small and unremarkable. 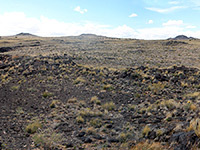 More interesting is the eastern edge, a steep slope of broken lava blocks, since here are found approximately 24,000 petroglyphs, most dating from the Ancestral Pueblo period of 1300 to 1600 AD, made by chipping away the dark, weathered surface of the lava to reveal the light-colored rock underneath. The carvings have a huge variety of designs, some very complex, including animals, hunting scenes, people, masks, geometric patterns and abstract shapes, and in many places occur in dense groups with dozens on a single boulder. There are three designated sites for visitors, at Rinconada Canyon, Boca Negra Canyon and Piedras Marcadas Canyon (see map), part of Petroglyph National Monument, which was created relatively recently (1990) and includes 11 square miles of the mesa together with five fissure volcanoes, reached by a less-traveled route to the west. 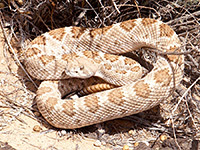 The main part of the monument, in the east, adjoins the Albuquerque suburbs so a visit here is a long way removed from a wilderness experience but the land on the plateau is suitably arid and desert-like, sprinkled with cacti and home to rattlesnakes, lizards and other elusive creatures. 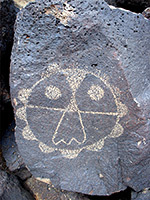 Despite the proximity to the city, the petroglyphs are largely free of modern graffiti, and although some are faded and indistinct, many are crisp and well defined. Visiting times can range from half an hour for a quick walk along one of the paths or a full day if hiking all trails and exploring the volcanoes. The nearest hotels to Petroglyph National Monument are in west Albuquerque, around exit 155 of I-40. The national monument, to which entry is free, is well signed from both nearby interstate highways (I-15 and I-40), and reached by wide city streets through residential districts. First stop should be at the visitor center, situated at the foot of the mesa along Western Trail NW, from where the most interesting site (Rinconada Canyon, which has the longest trail) is one mile south, while the other two are a few miles further north. Off-trail hiking is possible though not encouraged, and the mesa edge stretches for over ten miles within the monument so there is plenty of scope for discovering new petroglyphs, away from the popular areas. The Volcanoes section in the west is 5 miles north of I-40 exit 149; a short, recently paved spur road leads to the trailhead for a 3 mile loop path around three cones (JA Volcano, Black Volcano and Vulcan Volcano), where such features as spatter magma, cinders and ash can be seen. The parking lot for Rinconada Canyon is just off busy Unser Boulevard, at the junction with St Josephs Avenue. The 2.2 mile loop path to the petroglyphs leads westwards along the north edge of the canyon all the way to its upper end, then returns through grass and sagebrush in the middle. The ground is quite sandy underfoot so the walk can be slow, and hot in summer (up to 95°), though there is no significant elevation change. The drainage is about half a mile wide at the mouth, edged by steep slopes covered by big lava blocks, which are easy enough to climb, and reach the plateau above, for good views over the Rio Grande valley, the Sandia Mountains and the volcanoes to the west (see panorama). The petroglyphs are generally more faded and fewer in number at the start, becoming more numerous and more complex around the upper end of the canyon. A few more recent designs have been added by later visitors, including signatures dating back to the early 20th century, but most rocks have only the original carvings. Perhaps the very best locations are a little way above the path at the far western edge. 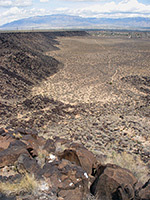 The most developed part of Petroglyph National Monument is Boca Negra Canyon at the north end of Unser Boulevard, where facilities include drinking water, restrooms and shaded picnic areas. A loop road passes the trailheads for three short, paved walks to petroglyph sites, visiting about 150 drawings - many fewer than Rinconada Canyon which has over 1,000, but there are still plenty of impressive specimens. Unlike other areas of the monument, a parking fee is charged here, of $1 weekdays and $2 weekends. More petroglyphs can be viewed by another, less used path (the Canyon Trail) a little further north. At the northernmost point of the national monument, Piedras Marcadas Canyon is a wide, branched valley containing several hundred petroglyphs on the north side, toured by a one mile trail that begins from either of two small parking areas next to a residential estate. Access is from Golf Course Road near the junction with Paradise Boulevard. The drawings are just as good as those at other areas though this location is the closest to the Albuquerque suburbs, so noise and litter can be present.